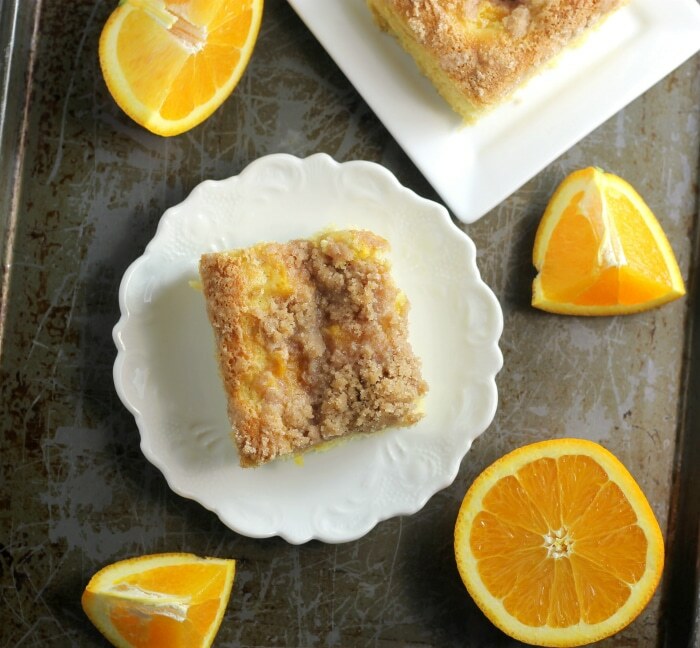 Orange cream cheese coffee cake is one of those recipes that takes a little effort, but the results are fantastic. 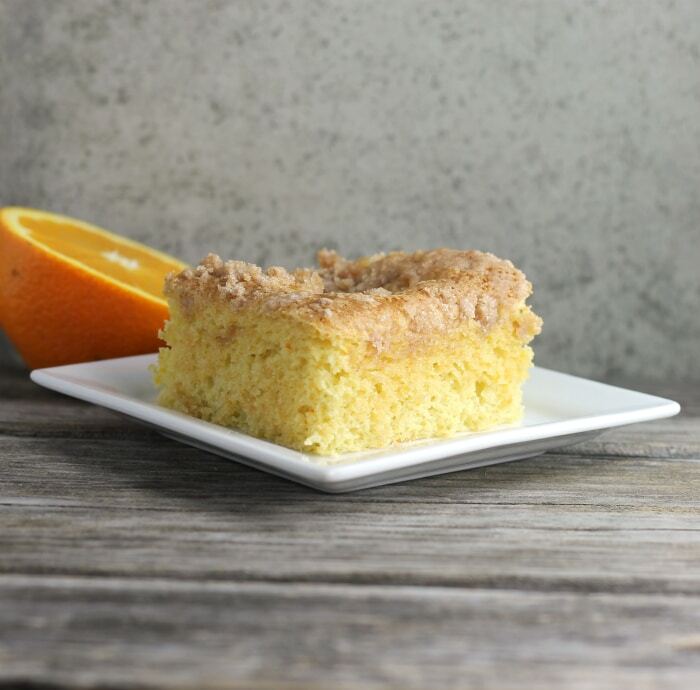 I decided to use up an orange that was left behind in the refrigerator and decided that coffee cake would be a great way to use it. The orange cream cheese coffee cake turned out so delicious that I bought another orange that same week and made the coffee cake again. Coffee cake is one of those breakfast foods that I like to make and serve on the weekends. I really like coffee cakes that you can throw together with little effort and have them on the table in under an hour. 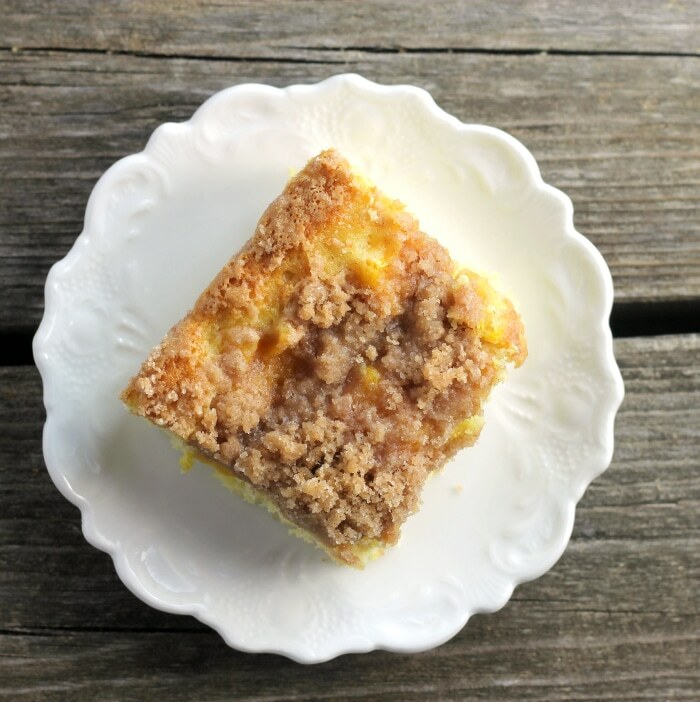 Even though I do enjoy serving coffee cake for breakfast or brunch I have been known to serve a slice for lunch or dinner too. The coffee cake is super moist which is the result of the cream cheese and the bit of orange that is sprinkled over the top of the cake. The coffee cake starts out with making the cake, which is pretty basic. You know flour, eggs… I think you get the picture. But then you take an orange and chop it into small pieces and sprinkle that over the top of the cake. A cinnamon crumble is then sprinkled over the top of the oranges. If you know me at all I love my crumbles. Yeah, if you don’t have some kind of crumble on a coffee cake, well it really isn’t a coffee cake. At least for me. Before my blogging days, I would have never thought of combining cinnamon and orange together. But to my surprise, I really enjoy the two flavors together. In a medium bowl beat the cream cheese with an electric mixer. Add the butter and beat until the cream cheese and butter are combined. 2. Add the sugar and zest mix in. 4. Mix the flour, baking powder, baking soda, and salt together. 6. Spread in a 9-inch baking pan that has been lightly greased. 7. Chop the orange into small pieces place in a bowl with 2 teaspoons of sugar and set aside while making the crumble. 8. Mix together the cinnamon, sugar, and flour. 9. With a fork or by hand mix in the 3 tablespoons of butter. 10, Top the cake with the orange pieces. 11. Sprinkle the topping over the cake. Bake for 35 to 40 minutes or until a wooden pick come out clean. We just love anything with crumble! This is a great coffee cake, Dawn. I love these flavors! No wonder you made it twice! I love when a bake is so good, that we make another one right after. I’m a big fan of cinnamon and orange. When I was a kid, that was the first thing I made to bring into class for a project, cinnamon orange french toast. Heaven, that combo, well trio really, with the maple. 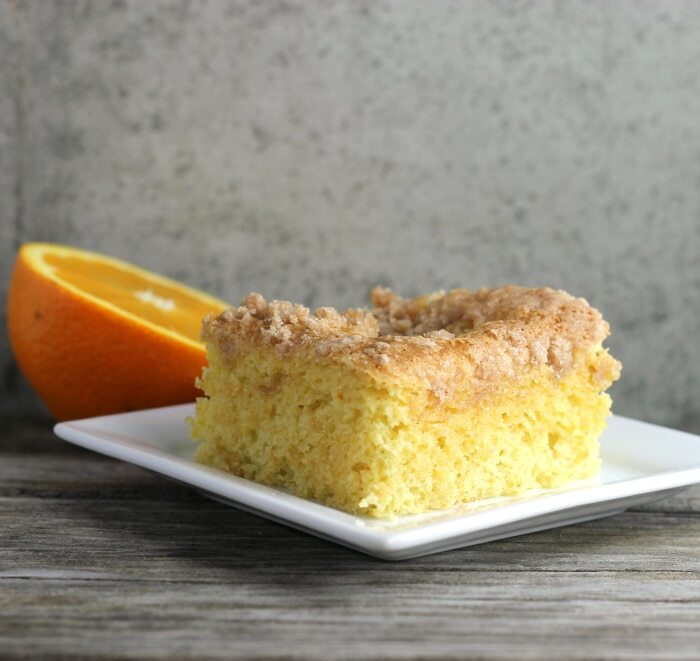 Coffee cake is something my husband loves a lot.And I love baking it to him,never tried with orange though.I think I should give it a try.Thanks Dawn. I love salads for a meal during the summer! Very nice!